just up the pike: what's up the pike: busy weekend, huh? what's up the pike: busy weekend, huh? 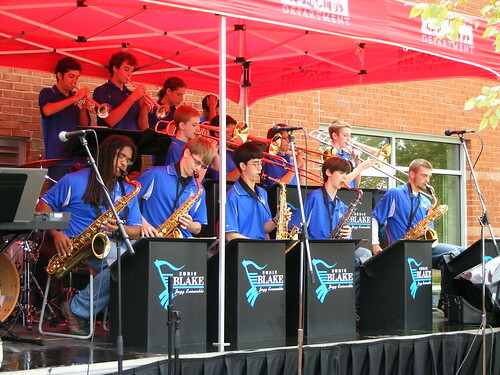 - The East County jazz scene generally begins with Blake High School's swing band (pictured) and ends with the Olney Big Band. Now there's a new entry: Swingtopia, an eight-piece outfit led by Doug Elliott and featuring our very own Cyndy, who writes the blog Photocynthesis, on the bass. They'll be making their first appearance at Greek Village, a restaurant in Colesville best known for the deer that crashed through their window last year. "If we get a good crowd on Monday it might become a regular thing," writes Cyndy. "They have a dance floor and the food is excellent." Check them out at 8pm Monday at the restaurant, located at New Hampshire Avenue and Randolph Road. - If you missed the Haiti benefit concert at Jackie's last week, you've still got plenty of opportunities to help out. (No, seriously. There are so many ways, there isn't an excuse not to.) Local youth group Mixed Unity is raising money with a bake sale on Ellsworth tomorrow from 2 to 6pm. Proceeds are going to the Caribbean Help Center, a Silver Spring-based charity that works with the local Haitian community. For more info, shoot an email to mxdunity at gmail dot com. 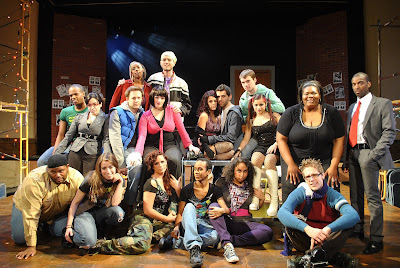 - If you haven't already, check out Kensington Arts Theatre's production of Rent, running through March 7. Local blog Just Up The Pike calls it "inspiring" and " an onslaught of take-no-prisoners optimism and reckless angst." Check it out at 8pm tonight inside the Kensington Town Hall, 3710 Mitchell Street. For more info, check out KAT's website. - Meanwhile, the Forum Theatre troupe kicks off their latest production, Amazons and Their Men, a play "loosely based" on the life of German propagandist Leni Riefenstahl. The show's on tonight at 8pm and runs through March 20 at the Round House Theatre on Colesville Road. You can purchase tickets online or visit the box office at Round House's branches in Silver Spring or Bethesda. - Celebrate the deliverance of the Jewish people from Persia at a Purim Festival this Sunday from 1:45 to 3:30pm on Ellsworth Drive between Fenton and Georgia. Hosted by the Ohev Sholom synagogue in Shepherd Park, the festival will include live music, a magic show, pony rides, and free hamentashen. Thanks for the plug Dan! It should be a good time on Monday. Another interesting option for this weekend and next, if people feel like venturing down to DC,is Scott Joplin's opera Treemonisha which is being put on by the Washington Savoyards at the Atlas Performing Arts Center on H Street. It's an excellent production and the music is delightful - operatic but based on Scott Joplin's ragtime rhythms. Considering how much jazz is going on in DC each week, i'm happy to see an actual big band playing in East County.